I’m a sucker for a great lip balm! It seems like every time my daughter and I go to the store we are buying more lip balms. This easy DIY craft is not only easy to make but is tinted so that it looks like you’re wearing a little bit of lipstick. I promise you that once you make this you’ll never want to go back to the store-bought stuff. 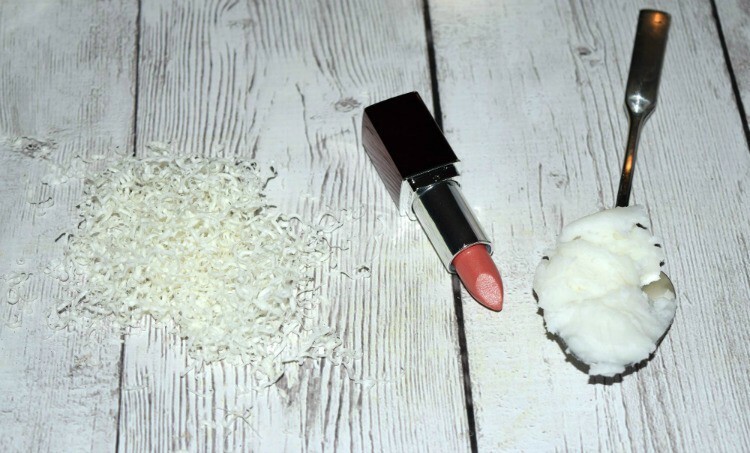 You’ll also love how much money you can save by making your own lip balm. Place your pan filled with water onto the stove and let it come to a rolling boil. While you’re waiting for your water to boil take your hand grater and grate down your block of beeswax. The process is so easy and it will literally slice up in seconds. Pour your grated beeswax in your bowl and then top off with your coconut oil. Drop your lipstick on top of the ingredients and place your bowl on top of your pot full of hot water. The ingredients will melt quickly and you want to stir along the way to make sure they all blend together. 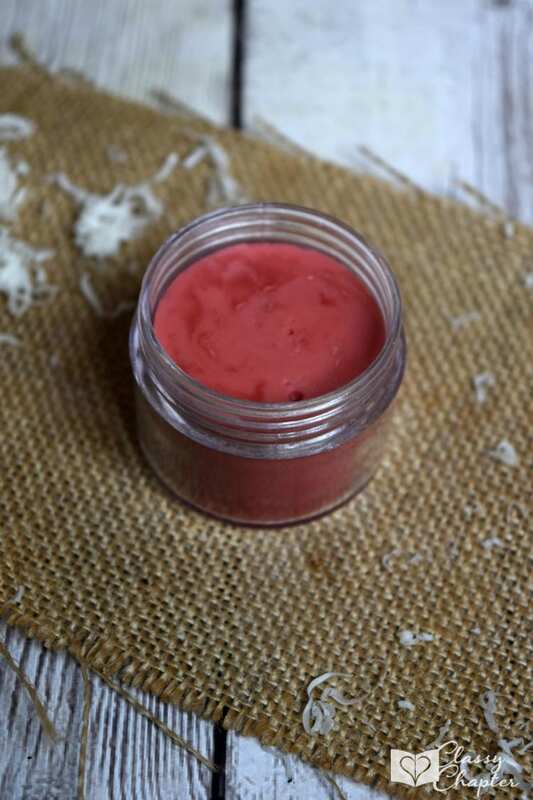 As soon as everything is melted and blended quickly pour your lip balm into your clear containers and let it sit for 5 minutes. 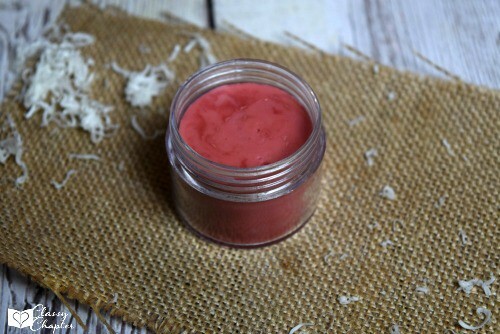 After 5 minutes, your lip balm will be solid and ready to be used. Enjoy that hint of tinted, moisturizing lip balm. Get creative with this recipe and try making several different colors. You really can’t go wrong and you’ll have tinted lip balm that’s personalized to fit your unique style. 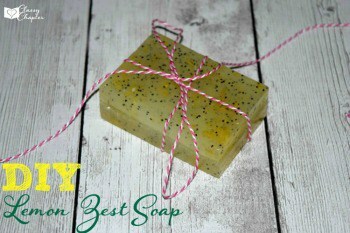 If you enjoyed this post make sure to check out DIY Lemon Zest Soap Bar post below. This stuff smells amazing and leaves you feeling fresh and clean. Love this Kristie! Pinned & hope to try soon. What a cool idea! I am lip balm, lipstick, lip anything! I can’t ever be without it. This is easy enough for us not so DIY folks. Congrats on your feature for Wine’d Down Wednesday! I love this! I’m going to try it this weekend as a mothers day gift. I done it before with a super shimmery light brown eye shadow that came out gorgeous. I love playing with different colors to make the perfect shade. Thanks for posting! My 4 year old daughter would love this. She is always asking me for “lips” which means she wants my lipstick so I’m going to make her some of this to help my lipstick go further with her addiction! She will love it! My daughter is 6 and loves having her own lip gloss.